This blog post is a surprise and I’m surprised why this change is not documented anywhere. Me and my friend, Kishore were discussing about this conversion where he had a big number of users who are still using EXCEL Add-in and like many of the discussions floating on web (on Smart View and Add-in) we also had a fair deal of – Smart View is better than Add-in and vice versa. There were many questions that you’ll get from the community where they find the change difficult and different. He said he can do that in EXCEL Add-in. I was like “No you cannot do that in Add-in, it stops the drill down if the alternate hierarchy parent is there”. I didn’t say that aloud. Even though I didn’t know how to do that in Add-in I did give him the idea on how you can make it work in Smart View. If you’ve not used it – There is an option in Smart View which will allow you to zoom in on formulas (The formula can be a member equation or a consolidation to the parent). This method won’t give the correct results if there is a child which is ignored or never consolidating. 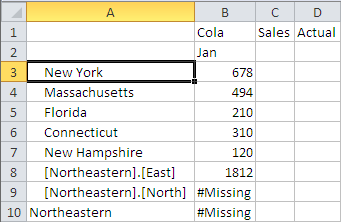 You can use Free Form mode in EXCEL Add-in to perform the drill down on a shared member. The only place I’ve used Free Form mode is to run report scripts. I did like that option in EXCEL Add-in and I thought of finding an option in Smart View which can really work. I was trying to replicate this in Sample Basic (I had to modify it to add a alternate hierarchy) and this is how my Market dimension looks like. What happens when you drill down on East, when you’ve Northeastern in the grid? Yes, you guessed it right. Nothing it won’t drill down. 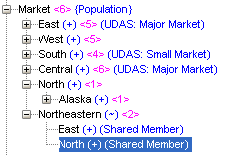 In grid clients (for example, Oracle Hyperion Smart View for Office), you can reference shared members as unique from their base members by typing them with a qualified name (for example, [Parent].[Child]). Shared members can be referenced with qualified names even if you have not set the outline to enable duplicate member names. Note that the regular member 150 contains children; the shared member 150 does not. Drilling up and down on 150 gives different results. Drilling down on 150 returns nothing if interpreted as the shared member; or, return 100 10 and 100-20 if interpreted as the regular member. Drilling up on 150 returns Test1 if interpreted as the shared member; or, return 100 if interpreted as the regular member. If Test1 is on the worksheet and very close to 150, Essbase Server understands that 150 is the shared member and drilling down does not result in the children, 100-10 and 100-20. If Test1 is not on the worksheet or members are in between them, Essbase Server understands 150 to be the regular member so drilling down results in the children 100-10 and 100-20. As I said I was trying to find a perfect answer and tried this on 11.1.2.3.500 Essbase server. As I was playing around I accidentally double clicked on East. Guess what (see the difference in the member names – East is East in 11.1.2.3.500), you can drill down on a Shared Member in 11.1.2.3.500. I was first thinking that it could be a Smart View/Excel Add-in version issue (Kishore had an older and I’m using the latest). I looked at my Software inventory 😉 and was able to get an older version of Add-in and Smart View. I could drill down on those versions also, which made me look at the Essbase version. I patched it to 11.1.2.3.001, just because this patch fixed the issue with the way Shared members were showing up in Smart View (shared shows up as unique member) and see whether this behavior started from that patch and no one noticed it. You can read more about the issue here. Retrieve the same sheet in the patched version and zoom in on East voila. The long ask for drill on Shared members is here. It is confirmed that from 11.1.2.3.001 onwards you can now drill down on a shared member. If you zoom in using bottom level it'll stop at the bottom level of the alternate hierarchy (won't expose the children of the shared parent). To see the actual level 0 members of a shared parent you'll have to zoom in on that member, here all zoom in option will work. That's really interesting! It's always driven me mental that that isn't default behavior. If this is an Essbase cube, then you might have to look at the metaread filter and limit it. Hello, I know it has been a while since this post, but I am curious – I am using Essbase 11.1.2.3.508 and Smart View 11.1.2.5.000 Build 111 and I am not able to drill down into shared members. We are seeing this in Smart View as well as in CXO Cockpit. It depends on the hierarchy structure too. Can you please try that again Sample Basic and see if that is working? Thanks for the quick reply. 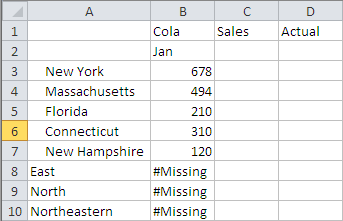 I tried adding a shared member to Measures in Sample Basic and was able to drill in. However, when I added shared members to Market, I couldn’t drill in. Were you able to get the drill to work on a Sparse dimension? But when I expand AltMarketSparse and TotEW, I can see East and West but I cannot drill into them. If I remove the parent TotEW, then I can drill into it. So it appears that the generation and/or level of the shared member comes into play. So I tried adding more levels in the original structure and then I couldn’t drill on East anymore. I even tried getting them to the same generation and I still could not drill into East. If you have any ideas on this I would appreciate it. My hierarchies are quite deep and users are wanting to drill in.